Based on the dismal data from the Minneapolis Federal Reserve (as well as our own experiences), we know Obamanomics doesn’t work in the United States. But we also know bigger government doesn’t work in France. And we know it doesn’t work in Japan. We know it doesn’t work in Spain. We know it doesn’t work in Argentina. We know it doesn’t work in Greece. But some people never learn. The President of Mexico has unveiled a new scheme to increase taxes to finance bigger government. Here are some details from the New York Times. President Enrique Peña Nieto proposed on Sunday a sweeping overhaul of his country’s tax system, intended to collect billions of dollars to finance new social programs. …Mr. Peña Nieto described the broad outlines of his plan, which would eliminate many loopholes and exemptions that favor the richest Mexicans. He proposed new taxes on capital gains, carbon emissions and soft drinks, and increased income taxes for those making over about $39,000 a year. But give Senor Nieto credit. Unlike most politicians, who claim that higher taxes are for deficit reduction, he freely admits that he wants to expand the welfare state and create more dependency. …the revenue it would generate would pay for a new universal pension for all Mexicans over 65, a new unemployment insurance scheme and more spending for schools and infrastructure. Amazingly, there are some who think a bigger burden of government spending will improve Mexico’s anemic economy. …he is trying to swiftly inject some dynamism into an economy that has failed to grow any faster than 2 percent a year, on average, since 2001. Yeah, good luck with that. I’m still waiting for someone to show me an example of a nation that became prosperous by making government bigger (and if any leftist readers say the Nordic nations, I’ll simply point out that they became wealthy when government was small and that their economies have grown much slower since the welfare state was adopted). But Nieto is probably right about his policies transforming Mexico. Just like 1917 was a year of transformation for Russia. While it appears that the government has the votes to push through its bad plan, there are a few rational voices in Mexico. Heck, maybe we can get Mr. Pardinas to come to Washington. We have plenty of obscenities in our budget. But let’s maintain our focus on Mexico. The first thing I do when I analyze any nation is to look at the data from Economic Freedom of the World. 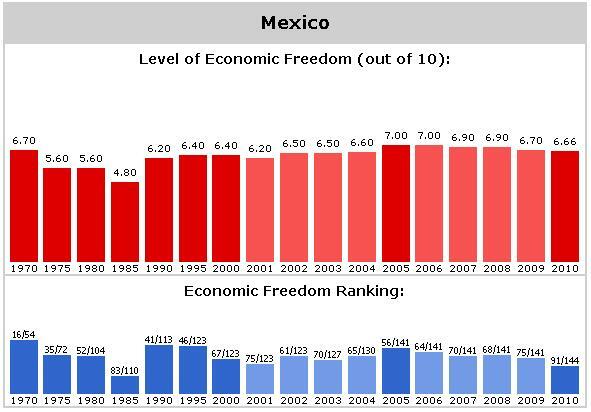 As you can see from the chart, Mexico is suffering from statism. It ranks only 91 out of 144 nations and it’s score has dropped significantly since 2005. That being said, if you scroll down to page 114 and look at the details, you’ll also see that Mexico’s best grade (or, to be more accurate, the country’s least-worst grade) is for fiscal policy. Mexico’s bigger problems are in the areas of trade policy, rule of law, monetary policy, and regulation. So it’s theoretically possible that President Nieto could make Mexico more prosperous if he raised taxes while simultaneously adopting significant free-market reforms for other sectors of the economy. But don’t hold your breath waiting for that to happen. Politicians who support bad policy in one area generally tend to support bad policy in other areas. As explained in this video, the recipe for prosperity is free markets and small government. Well, Mexico doesn’t have free markets and its President now wants to compound the damage by increasing the size of government. Anybody want to guess how this turns out?